Team GearJunkie, our in-house adventure racing squad, is preparing for a season of events around the country and the world this year. Heads are still spinning a bit for the members of our GearJunkie/YogaSlackers squad after more than a week of racing last month in Chile at the Patagonian Expedition Race. (We covered the team’s experience and its 3rd-place finish in a post called simply “High Insanity.”) Next weekend, our GearJunkie/WEDALI team starts its seasons in high gear with some tough competition and a stout course at the LBL Challenge that’ll present 24 hours of run/bike/paddle action in the Land Between the Lakes region of Kentucky. The LBL Challenge event is held in the same area as WEDALI raced last fall when it won the Adventure Racing Championship, the season finale event in the Checkpoint Tracker race series that attracts many of the nation’s top teams. You can follow our team’s progress all year on the new and improved Team Micro-Site, which includes race reports, gear reviews, a race calendar, and videos. Our full team roster is up, and the squad is immersed this spring in training, travel, and racing around the world. Stay in touch and follow the action as Team GearJunkie pushes toward a goal of being a top team on the domestic and international AR circuit again in 2012. Race on! 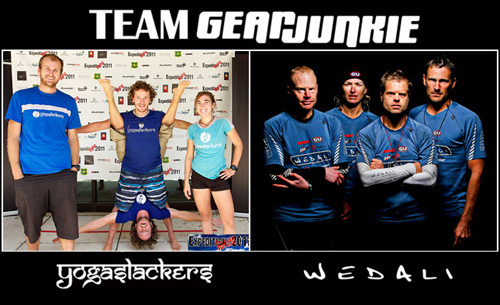 —Stephen Regenold, founder of GearJunkie, will race with both GearJunkie/YogaSlackers and GearJunkie/WEDALI throughout 2012.